What Are the Different Types of Wood Lathe Parts? The cutting tools attached to a lathe vary in size and function. Wood lathe parts are devices that are used for attaching wood to the lather and the cutting tools used to complete a project. 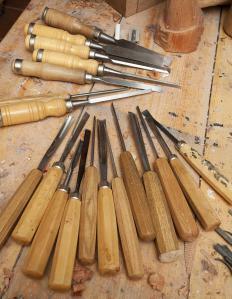 The cutting tools and chisels used in wood turning vary in size and cutting function. Wood lathes themselves also come in a variety of sizes, and each accommodates a maximum size, in diameter and length, of wood. The pen lathe, also known as the micro lathe, the mini lathe, and the floor lathe are the three basic types of lathes. Attaching wood to the lathe usually requires interchangeable wood lathe parts that are mounted on the headstock spindle. Drilling a hole through the center of shorter wood pieces accommodates bolts, which may screw directly into the spindle. Hobbyists often attach faceplates to wood having larger diameters, which then attach to the spindle. Longer pieces of wood are usually attached to the headstock and the tailstock by turning spurs. Turning spurs are small cylindrical pieces of metal, squared on one end and tapered to a point on the other. The point is forcefully inserted into the center of one end of the wood, and the squared end is inserted into the chuck and tightened. The chuck may have three or four jaws, which can be adjusted to change the diameter by the turning a T-shaped key. Three jawed chucks generally engage all jaws at once, but four jawed chucks may allow adjustment of each jaw individually. Wood lathes use hand held cutting tools and chisels, and these wood lathe parts may be purchased individually or in sets. They include gouges, skews, and parting tools, all of which have different cutting surfaces. Some gouges are designed exclusively for spindle woodturning, while others, of sturdier construction, can be used for faceplate woodturning. Gouges have a u-shaped cutting edge, which are useful for rough cuts or rounded shaping. Skews have beveled, squared edges, capable of making smooth, flat cuts. These wood lathe parts can also be used to plane the surface of the wood. 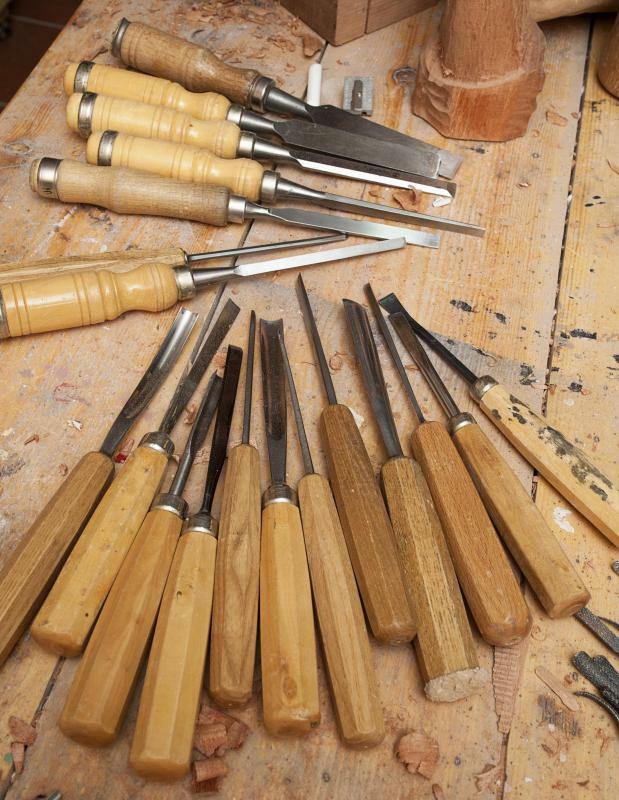 Parting or beading tools cut narrow grooves and can be used to square off the ends of wood. Hobbyists also use them to separate, or part, one section of wood from another. Pen lathes are usually table top models that may weigh as little as 30 pounds (13.6 kg). As the name suggests, people usually use this size of lathe to create pens, but the device can often hold pieces of wood up to 2 inches (5 cm) in diameter. A larger type of tabletop lathe is the mini-lathe. The standard size accommodates pieces of wood measuring 12 inches (30 cm) in diameter and 36 inches (91 cm) in length. Floor lathes also vary in size with some machines weighing as much as 1,000 pounds (453 kg.). What Are Lathe Chuck Jaws? What Is a Lathe Chisel? What Are the Different Types of Wood Lathe Tools? What Are the Different Types of Lathe Parts? What Is a Wood Turning Chisel? What Is a Pen Lathe?